Josiah was a man of God and at age eight he became King. Right before he became king, his father’s servants conspired together and killed his father in his own house. Later, the servants were killed by the people of the land and then they made Josiah king. What a young age to rule a kingdom… What a responsibility in his youth! How many of us would trust an eight year old they knew to rule over them. Probably not many. However, Josiah took on that responsibility. He could have caved into the pressure around him to do evil, like his father did, in the sight of the Lord. He could have followed the ways of his people and worshipped idols and burned incense on the altars to false gods. But there was something different about Josiah. He was not unstable like his father. Perhaps he was influenced by a servant who knew the true God and expressed Him to Josiah by deeds of selfless love. Or maybe it was the partially ruined temple that suggested there was another Way. Or maybe it was the definition of his name, “Yahweh Heals,” that sparked his curiosity. Whatever it was, the Spirit of the Lord was working on him. At age 22, Josiah started to seek the God of his ancestor David. Four years later he began to purge Judah and Jerusalem of the carved and twisted images, as well as the altars of the Baals. I started to think about the people in Josiah’s time and how they were worshipping idols of irrelevance and burning incense on altars of futility. I thought about what we would have done back then if we saw them do those things. Then I started wondering if we do the same things but in different ways. Do we have our own idols and altars? Have we fallen into the same trap as they had in focusing on worthless things? Could we somehow be preventing God to work miraculously in our lives by doing some of the same things back in Josiah’s time? I would like to suggest that the reason Jesus hasn’t come again is because we have gone after other gods and not consecrated our lives to Him. “How?” you might ask. “We worship every week on the day God has ordained. We have no idols of stone or gold in our sanctuary. We don’t even burn incense to other gods.” Well, maybe not. But maybe there are other things that don’t seem to be so obvious, but equal in effect. We can start by looking at things in our lives that we place a higher value on than with God. Do we spend more time on the Internet creating our own reputations in social realms than we do developing our character through God’s Word? Could it be that we know more about what is happening in the NASCAR circuit than what God’s will is for us? Are we too lazy to get up and go spread the message of hope and love to people we don’t know… or even like? Are we so much into reality TV that we don’t know the reality of our situation, that we are sinners needing redemption? How do we tackle these idols and altars in our lives? Well, by handing our lives over to God and spending time in prayer, study and witnessing. Count the things in this world that you love more than God. Acknowledging these things is vital to the removal process. Once we understand that there is nothing more important in our lives than to reach the goal of our salvation, we will never look at our spare time the same again. Once we understand that we are only living in a world that will fade away, we will long for our heavenly home and refocus our time and efforts. But these idols and altars, what do we do with them? We have to say no to the things that draw our attention away from the Creator. We have to completely withdraw from these things. We have a mission to accomplish… to finish the work God has laid out for us. We need to brush the blood of Jesus on the entryways to our homes like they did in Egypt, signifying that they were covered by the Lamb of God. We need to brush that blood on our TVs and on our music playlists. And what about our wallets and purses? We need to apply the blood there to show that everything is God’s. Josiah didn’t simply throw the altars and idols in a trash pile where they can be sorted through or retrieved. He grounded them to dust so they did not exist anymore. We see the same thing with Moses when he came down from the mountain and saw the golden calf. He didn’t just knock it over; he burned it and then ground it into powder. And we see the same thing with the image in Daniel 2 that represented the kingdoms that will exist on earth. They were not only removed, they were crushed by the large stone that represented God’s kingdom and made like chaff so that the wind carried it away, representing the total removal and nonexistence. That is what we have to do with these altars and idols in our lives that keep us from a relationship with the only One who is relative to our salvation. Real reformation and revival doesn’t come from a pastor or a church leader. 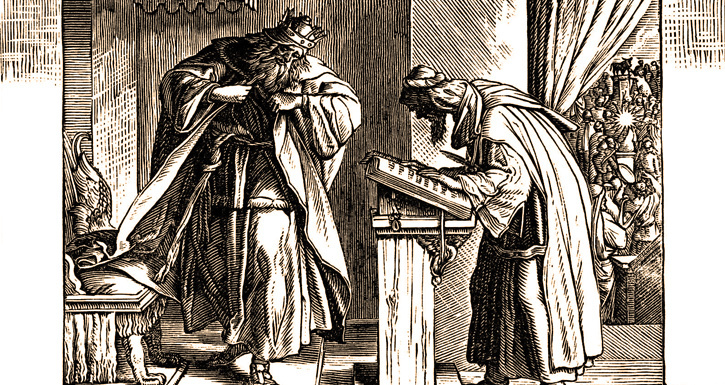 Israel followed after what Josiah was doing, but their hearts were not in it. When Josiah died, the next king came along and did evil in the sight of the Lord and the nation followed after the same ways. Dependency on a pastor or someone else for revival will never work. Real revival starts with you and me and creates sweet burning incense to God. Then, and only then can it influence a revival in others. What is God saying to us this today? Come, all you who are thirsty, come to the waters; and you who have no money, come, buy and eat! Come, buy wine and milk without money and without cost. Why spend money on what is not bread, and your labor on what does not satisfy? Listen, listen to me, and eat what is good, and you will delight in the richest of fare. In Ancient Orient, the milk, wine, and bread represented the “good things” in life. You had made it in life if you had those things. They were momentary things and what God offers is free and eternal. We spend too much time on things that are fleeting away and not enough time on the eternal things like the Word of God, reaching out to the lost, helping the poor, and clothing the needy. Don’t we want to see an end to disease, pain, suffering, dying? Are the idols and altars in our lives really worth more than what Jesus wants from us? Jesus will return when He sees that we are ready for Him. Let’s get ready.